One of the first public buildings built by the new Reichsland authority was the fine central station in Strasbourg (1883), designed by Jacobstahl, an architect from Berlin. In the departure hall, two fabulous gold-framed murals by Knackfuss celebrated the integration of Alsace and Lorraine into the Empire while reminding the traveller of a past period of unity. The murals were an assertion of historic unity and German authority. Naturally, they were taken down when the city was restored to France and I believe they are lost. The SNCF station now includes the TGV hub. The arrival of Kaiser Wilhelm II at a station clearly involved flags, bunting, grand motor cars and assorted worthies. 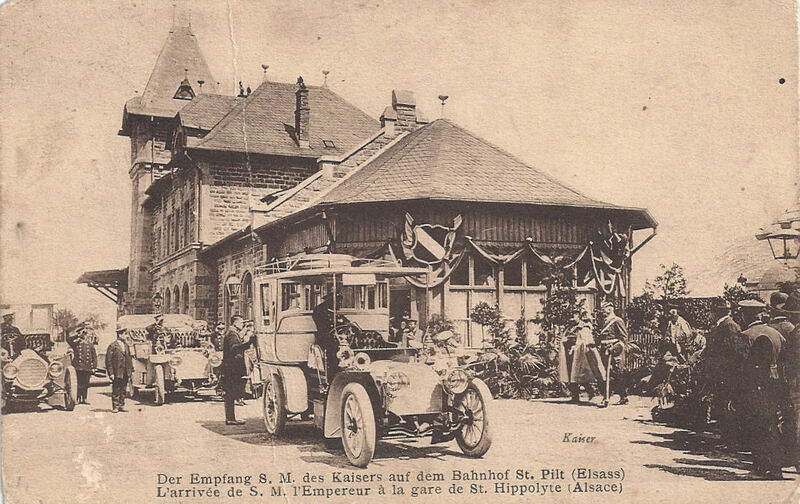 Here he is making his way to a car at the station of the small wine-growing village of St-Hippolyte (St Pilt in German). 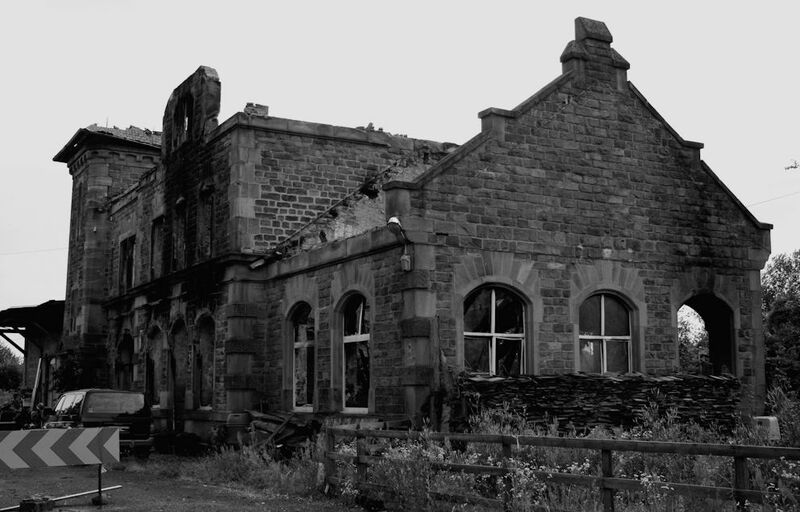 The station is now derelict and rather intimidating with large barking dogs roaming the grounds. I photographed it almost exactly one hundred years later in July 2012. 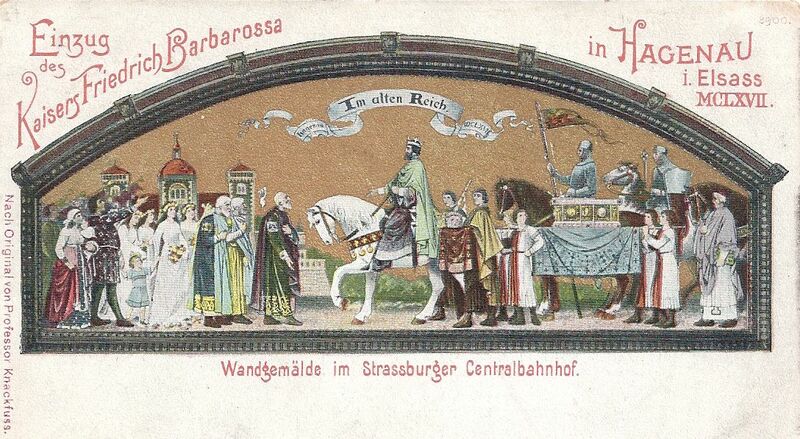 The card gives no indication about where the Kaiser and his entourage were travelling to, but St-Hippolyte is very convenient for his castle, Hohkönigsburg, in French Haut-Kœnigsbourg, which overlooks St-Hippolyte and the surrounding villages and vineyards. 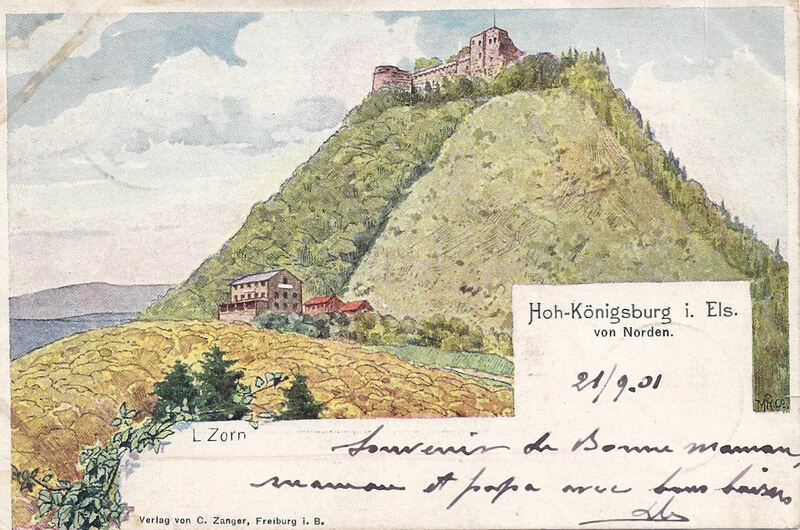 When Kaiser Wilhelm II took ownership of Hohkönigsburg, it was in ruins after fires and failed restoration projects. The nearby town of Sélestat owned the castle but, unable to fund its reconstruction, it offered to the Kaiser in 1899. 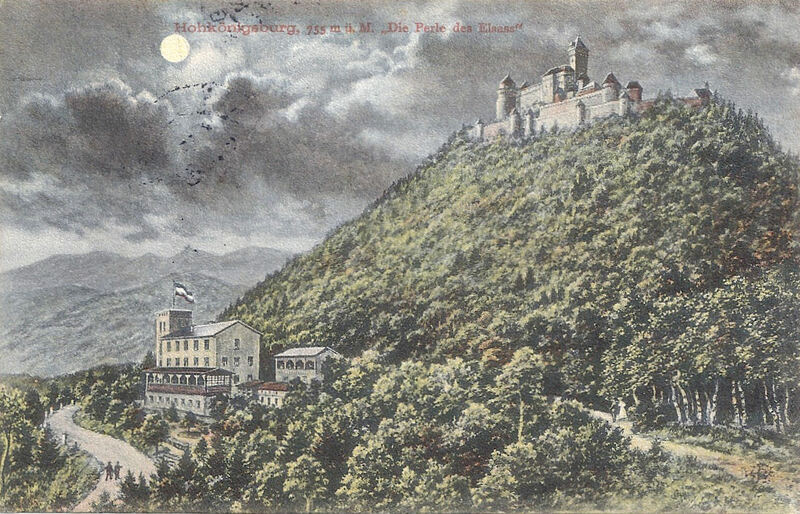 The potential to restore a fabulous castle on a magnificently prominent site was irresistible and Wilhelm II embarked on an ambitious project which would signal to all that Alsace was again part of the Empire. Between 1900 and 1908 this potent political symbol was painstakingly rebuilt in the style of a fifteenth century mountain fortress. Like the station in Strasbourg, it was yet another public building powerfully reinforcing the vision of Alsace aligned within his Empire – permanently. Today it is an immensely popular tourist attraction: vast numbers of visitors go there each year. 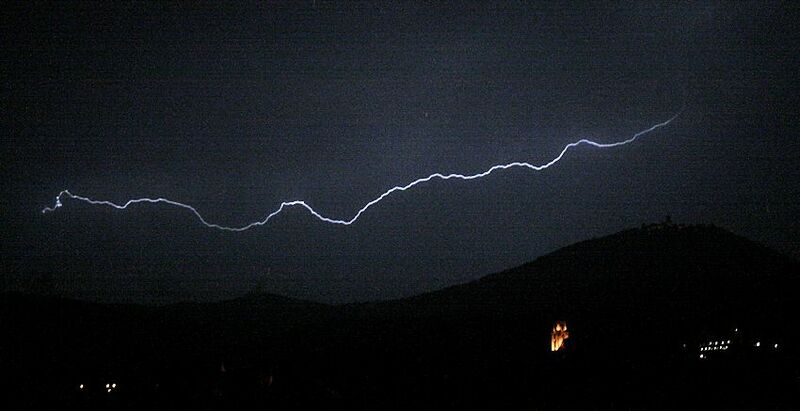 For this reason, I have not been inside Haut-Kœnigsbourg: I consider it’s best viewed from a distance. 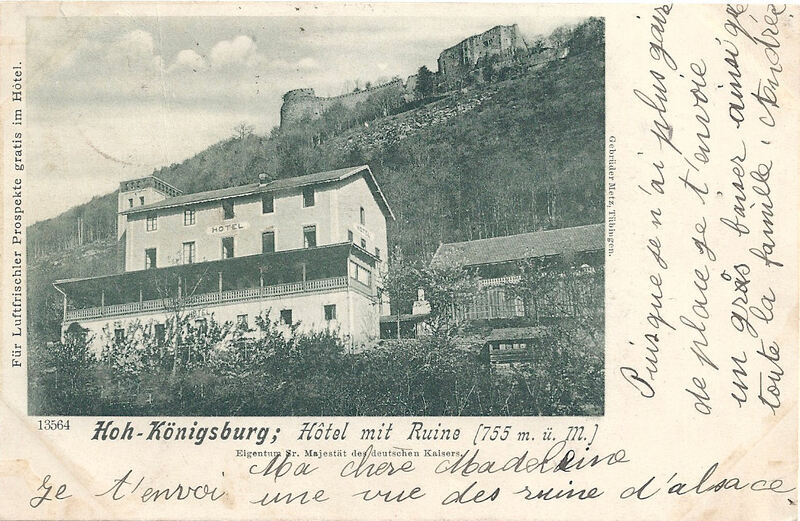 Wilhelm II never lived at Haut-Kœnigsbourg: I believe he never intended to. Locally it was a much criticised symbol of distrust and dislike. Even the pageant of its official opening took place in a deluge. It was not entirely finished in his reign: within five years of its completion, the storms of war were breaking across Europe. All postcards and photographs my own. 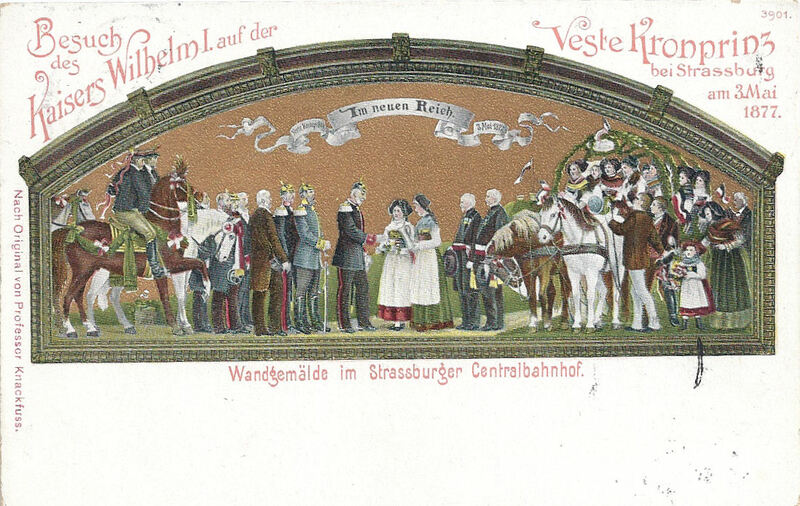 Categories: Buildings, Royalty, celebrities and personalities, Strasbourg | Tags: Alsace, Elsass Lothringen, Haut-Kœnigsbourg, Hohkönigsburg, Kaiser Wilhelm II, Reichsland Elsaß Lothringen, St-Hippolyte 68, Strasbourg | Permalink.